The First World War began and ended on rails. 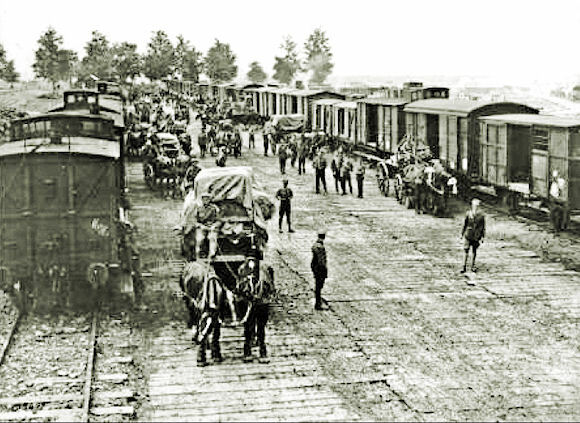 The 1914 mobilizations of the powers were accomplished with thousands of trains moving troops to their jump-off points. The fighting ended with the Armistice signed in Marshal Foch's private rail coach in a clearing in the Compiègne Forest. In between, the rail networks were essential for sustaining the fronts during the long period of trench warfare, and for assembling the shells, food, and stores for launching the great battles like the Somme. The Miracle of the Marne turned on Joffre's superior use of rail to re-array his forces. Creating and sustaining the trenches of the Western Front was impossible without the support of vast rail networks. Later, the big battles of the war would depend on transporting huge stocks of shells and reinforcements for both attackers and defenders. France's defense of Verdun, for example, was sustained during the great 1916 assault by a light-rail line paralleling the Voie Sacrée. And when the great rollback of the Western Front occurred in 1918, the Allies staged their battles either to protect their own lines such as at Amiens and near St. Mihiel or to attack the German network as in the Meuse-Argonne Offensive, which successfully closed the strategic Metz-Sedan-Mézières line. For all that is written about the tactical excellence of the German Army, it is not an exaggeration to say that the Allied leaders consistently showed a higher appreciation of the importance of railroads for their armies throughout the war. With our Centennial point of view, this year we will be featuring material on the American participation this year. One of the greatest contributions of the still-arriving American Expeditionary Force would be a massive expansion of Allied rail capability. They would bring over 1,000 locomotives and 20,000 cars, add 1,200 km of lines and provide tens of thousands of engineers and laborers to operate and maintain the rail network. My view is that railroad's story is the most neglected important aspect of the Great War. An enjoyable mystery novel based on the 'North Eastern Railway Battalion' is Andrew Martin's The Somme Stations, reviewed here in January, 2014. AEF Infantry (32nd Division is in my history) were put at "hard labor" building new railroads and warehouses soon after they arrived in France in March 1918. I'm sure this contributed greatly to the ultimate success of AEF forces in France. This account about railroads in WW I, is often a hidden story of WW I, amidst all the stories of battles. It is the huge story of logistics in war (beans, bullets, fuel), the SOS troops, and the trains that transported troops and material from seaports to the front to fight the war in France. One aspect of the railroad story in France was the story of the U.S. Post Office's Railway Mail Service and the Railway Post Office lines and RPO crews that brought the mail to the dough-boys by rail in WW I France. Here is a two part series entitled "The Railway Mail Service Goes to War: Bringing the Mail to Doughboys in WW I France" for "Roads to the Great War," telling the story of the Railway Mail Service with the AEF in 1917-1918 which later launched the Military Postal Service in the summer of 1918 for the US Army. Part 1 was posted on the website on October 7, 2016 (see: http://roadstothegreatwar-ww1.blogspot.com/2016/10/the-railway-mail-service-goes-to-war.html ) and Part 2 was posted on Saturday October 8, 2016 (see: http://roadstothegreatwar-ww1.blogspot.com/2016/10/the-railway-mail-service-goes-to-war_8.html ). 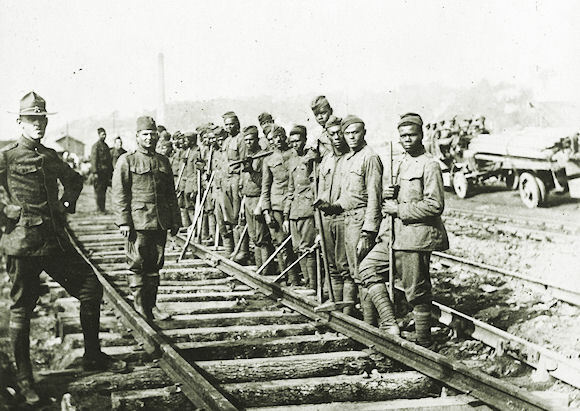 Railroads played an important role in The Great War story. Every Doughboy who got mail from home and sent letters back, got their mail by rail in WW I. Thanks for telling this great story. In the military mind, logistics take centre stage, but the arm-chair warrior mainly focusses on how battles unfold. For the latter, rear area activities are hardly ever considered. So railways, to amplify Mr Thompson's comment, are not the only "essential service" to have been largely ignored in popular accounts of the war. But at least the British Official History was decent enough to give "Transportation on the Western Front" a whole volume to itself! Glad to see this post on the railroaders, of which my grandfather was one. The 13th Engineers (Rwy), which handled the railways around Verdun, were also in France attached to the 2nd French Army long before regular American troops arrived. Interesting to compare with a prior German generation, the one that used rail so effectively at Königgrätz and Sedan.